Want to understand the left’s strategy? Wonder why community organizing is such a big deal and what it is all about? Reading Saul Alinsky’s Rules for Radicals will tie it all in for you. Counting among his disciples Barack Obama and Hilliary Clinton, Alinsky lays out how a step by step strategy for the left. Often used almost as a bible, community organizers go to classes to learn how to implement this strategy in their neighborhoods. A young community organizer named Barack Obama attended such meetings and even spoke at them. So what is Rules for Radicals all about? The first line in the first chapter says it all, “The Prince was written by Machiavelli for the haves on how to hold onto power. Rules for Radicals is written for the Have-Nots on how to take it away.” Built on the Marxian false premise that poverty is inherently the result of exploitation, Saul’s ideology drives him to seek social justice and economic parity (called equality). This book lays out his plan to accomplish this goal. It also lays out what Barack Obama said he wanted to fundamentally transform America. Seek to discover how the Democratic Party got so far left, Alinsky told 1960’s radicals at the Democratic convention they had 3 choices, “1. go find a wailing wall and fell sorry for themselves, 2. go psycho and start bombing- but this will only swing people to the right. 3. Learn a lesson and go home and at the next convention you be the delegates. Confused how the lefts shifting verbiage is so strangely disconnected from their actions? 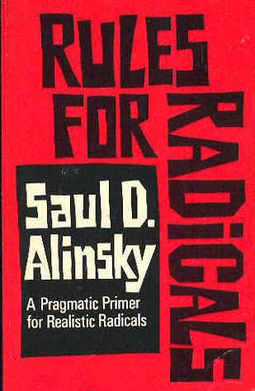 Alinksky said,”you do what you can with what you have and clothe it in moral arguments.” Again and again Rules for Radicals explains why the many on the left do what they do. The words and idioms of the book are terribly dated, stuck in the 1960’s reading it is like going through a time machine. Nonetheless, it is as relevant to the liberal mind as it was when it was written, which means it should be known to the conservative mind as well.